A smart home is a safe home. Smart technology enables you to create a unique environment you look forward coming home to. One that’s all controlled by you, directly through your smartphone, from wherever you are! Turning your house into a smart home has become a luxury most can afford, giving you personal, easy-to-use control over your security, appliances, entryways, climate control and energy efficiency. 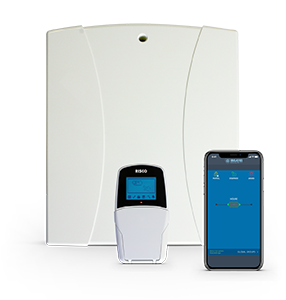 Arm or disarm your alarm system remotely, open or close your driveway gate or garage door with the tap of a button, and even save energy by controlling your lights or geyser directly from the mobile app. But even more than the comfort of convenience, smart solutions offer a sense of real reassurance. 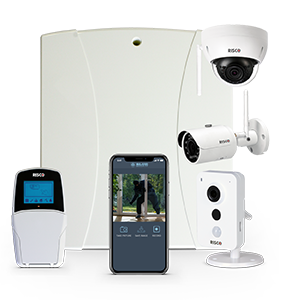 Receive video footage automatically recorded by CCTV cameras when one of your security devices are triggered, or check in with the kids through two-way communication cameras. Securing but enjoying your world hits close to home, make sure you do both the smart way. The benefits of having a smart home alarm system set up with the Blue Alarm app far outweigh the costs. Reduce the stress of worrying whether your home is safe by taking control into your own hands. Leaving home in a rush you can’t remember if you armed your alarm system. Quickly check the status on the app and do so remotely if it slipped your mind. Far too often we find ourselves at a braai, at the store or even out of the province when we are alerted to an alarm activation. If it was a confirmed false alarm simply silence the siren with the flick of a button, no matter where you are, and you will have guaranteed peace with your neighbours upon your return! Now that you can manage the core of your security, how about the additions that make an alarm truly powerful? 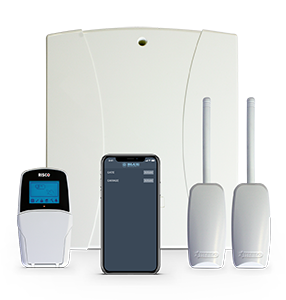 Any of your connected devices, from outdoor beams to electric fencing to a window mag lock, can be individually bypassed. If a particular detector is faulty and continuously triggers your alarm, you don’t have to be left unprotected by keeping the whole system disarmed. Simply switch off the defective unit directly from the app, which will even be highlighted to indicate an error, and continue to be secured. Another helpful feature is the ability to set up zone descriptions, to immediately be able to identify which area on your property has been breached. You are alerted to the alarm sounding, but you have no idea where the intruder is. Now you will be able to see that a beam in your back garden was triggered, which was connected to a nearby CCTV camera pointed at the area it covers, and you automatically receive a 30 second video clip of the exact moment the burglar moved through it. Using technology to our advantage for a safer home has never been this easy. They say no news is good news, but there’s nothing worse than not knowing. We’re living in the age of instant gratification, and how great is it that you can pick up your phone, launch an app that’s connected to your CCTV cameras at home, and you can see for yourself who’s at the gate, what the kids are up to, or why the alarm triggered? Use CCTV cameras to monitor the life of your home while you’re not there. Check in to see that your dogs haven’t gone roaming. Verify the identity of a deliveryman if you’re expecting a package or a municipal representative claiming to do a meter reading. You also get two-way CCTV cameras with a built-in intercom that lets you communicate with anyone in close vicinity, be it your children, domestic worker or gardener. They can both hear you and talk back to you (in the good way!) Remind your young ones to do their homework or stay away from the pool during summer, or even use the system as a nanny cam to keep a protective eye over your baby and let them hear your voice from afar. As one of your security devices are triggered, the corresponding CCTV camera will automatically capture still photos for image verification and send it directly to your phone. This will allow you to instantly see if it was a false alarm, which will both put your mind at ease and save on our resources if you continue to cancel the response. Additionally, if the incident is a confirmed break-in, you will be able to give our team a description of the suspect that will increase the chances of a successful arrest. Taking one proactive step further, your CCTV cameras can be integrated into our control centre that will send us five still snapshot images, at the same time you receive a 30 second clip, once the alarm has triggered. We will immediately be able to assess the severity of the situation, whether an armed robbery is taking place, if monkeys are parading through your yard, or even assess a fire situation if your smoke detector went off. It’s completely secure, we promise! You decide which specific cameras are linked to us, and we won’t have the ability to log in to them and view live footage at all. Strategically placed CCTV cameras will give you peace of mind and heart, at any time, from anywhere. Departing for a holiday is a bitter sweet moment. Whether you’ve secured your home to the max or have no security at all, the excitement is often overshadowed by the worry of leaving our deeply personal living spaces unoccupied for days at a time. A trusted neighbour can take out your post and feed your pets, but there’s very little more inviting to a burglar than a still, dark house with no sign of resistance. Habitation imitation reduces the appearance of your home as a soft target and will give you some extra peace of mind by making it look like you’re there, even though you’re not. Your family has a unique home routine. Scheduled activations like switching on and off indoor and outdoor lights, shades and the television can be pre-programmed in fluctuating patterns to imitate your presence. Tell your app how you do life, and it will do life on your behalf. Taking time off work or cutting appointments short to let a repairman, contractor or garden service into your property can be inconvenient, especially if you’re pressed for time and they’re running late. Through automation you can remotely open and close your driveway gate and garage door with great ease and convenience. From the beach, a restaurant, a hair appointment or big family gathering, simply swipe a button and you’re sorted. You no longer need to plan your schedule around the need for someone to be at home. Our favourite part is being spoiled with lazy weekend lie-ins! Let your domestic worker or gardener in, without leaving bed and lifting little more than a finger. It’s the life. Arriving to a home covered in darkness can be pretty frightening. Proper lighting is an excellent deterrent; flooding nooks and crannies eliminates any hiding places for opportunistic burglars. Before you leave for home, switch on outdoor and indoor lights through the app to settle your nerves and help you spot anything out of the ordinary as you start approaching the driveway. Use the app to be in direct control of your family’s essential energy consumption to be more efficient and sustainable in general. Switch off lights that are burning unnecessarily without leaving the couch, and effortlessly regulate the geyser to save on one of the biggest energy users in your house. Durban weather can be unpredictable and relentless, but smart technology allows you to get your home temperature just right for a comfortable and cosy return by placing control of the air conditioner and heater in the palm of your hand. Adding to the convenience of technology, reap the benefits by being able to manage your pool pump, Jacuzzi or sprinkler systems from the mobile app. Safer families, safer communities. Make the smart choice today. Home automation is affordable and scalable, and any existing alarm system can be upgraded to meet the functional requirements. Contact us to get started on creating your own unique environment that’s ramped up in safety, convenience and comfort.